What has happened to the fishing at Abbotsbury and West Bexington? I have had several emails asking where all the fish are down that end of Chesil. Well May water is what has happend! The Mackerel are staying further offshore in the clearer water. The water down the Portland end of the beach is pretty clear by comparison and plenty of Mackerel are showing there. There are some good Rays and Plaice coming from the Abbotsbury end of the beach, but as is typical with Chesil a long range cast is needed to get to them. What an amazing month I have just had. The number of hits for the website has gone through the roof. I have more than doubled last months figures and managed to hit 1.5 Million, with an additional 20% new unique viewers. It is only going to get better. I have lots of new tutorials lined up, as well as introducing new marks and advanced techniques, but first I am going to get some of the basics out of the way. Not so exciting for those of you that are already decent anglers, butI will have something for you as well. Longleat Fishing show: I mentioned last week that I may be attending the Longleat show on Friday the 14th and Saturday the 15th of June. Well I can now confirm that I will be there on both days to demonstrate modern lure fishing techniques. I am going to go through different styles including using surface lures and soft plastics. The demonstrations will take place on lake 2, and as soon as I find out what time I will let you know. However when I am not doing a main demonstration I have private access to lake 3, where I can do individual one to one sessions. If you would like a one to one session with me then send me an email, letting me know which day you would like one. I will only do 5 sessions each day, so it is strictly on a first come first served basis. I will be using the new range of Tronixpro HTO rods as well as my Century HPR and Majorcraft Zaltz and Crostage rods. This range of rods covers you from a good entry level rod to a top of the range rod. If you are thinking of buying any of these, this is your chance to actually cast and use them before shelling your money out on the wrong rod. The better news is that there will be plenty of much more interesting people than me around. The program is full of big names, that I cant wait to meet. If you want more information about the show click on the following link. Longleat Fishing show Last week I put up a link for some special discounted tickets for the first 100 fishing Tails readers. unfortunately they all went pretty quickly. The good news is I have managed to get another 50 at the discounted rate of £10 for an adult and £5 for kids You need to book through the following link fishing Show Tickets and use the following code ANG001. You will also be entered into a draw to win a £1000 worth of Hardy Grey’s tackle. Fish of the Month: I have had a late entry for the May fish of the month this morning from Brian Whiting. 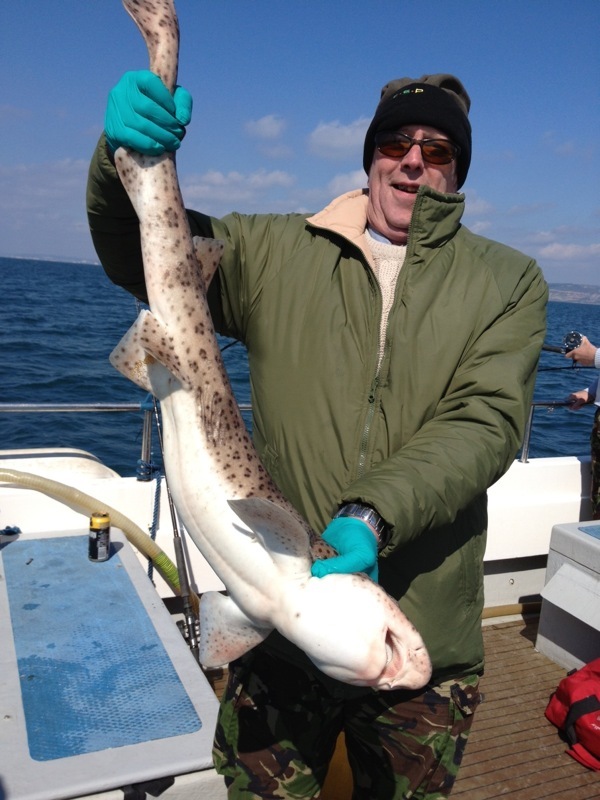 Brian was fishing out of Lyme Regis on Alice Rose and managed to land this lovely 10lb 9oz Bull Huss, just 4 miles from port. I know that there was a large Blonde Ray caught from West Bexington the other day and the angler the captured it has sent me the picture. I have not received it yet, so if it is you that caught it, then try again using the email link at the top of the page. Portland: Small waves, with good water clarity. Portland Harbour: Wavelets and clear. Chesil Beach forecast: Unless you can cast 100yds with bait, then it might be a better idea to stay clear of West Bexington and Abbotsbury. Mackerel are showing in good numbers from Ferrybridge along with some nice Smoothound. Night tides seem to be full of Pout and Dogfish at the moment, with none of the early summer species showing yet. Portland: If the fishing on Portland yesterday was anything to go by then the rest of the weekend should be great. I seen one angler pull in a Ballan Wrasse of over 5lb. Plenty of Pollock showing around dawn this morning, so dusk should be good as well. Church Ope Cove is producing Wrasse and Pollock. It also threw up a 3 1/2lb Plaice, which is unusual for there. Portland Harbour: Lots of people fishing around Ferrybridge. It is not a great idea to cast a bait into the channel there. The flow through the channel is pretty strong and carries plenty of weed that quickly forms on your line. This leads to tackle losses and lost fishing time. Fish the banks either side of the channel for best results, or use lures. Weymouth Bay: Preston Beach has produced some good Rays this week and I can see no reason why it won’t produce more this weekend. Stone Pier is fishing well. Mackerel and the first Garfish have been caught there, along with Pout, Pollock and Wrasse. One Response to "Catch report & fishing forecast for Dorset including Chesil Beach, Portland & Weymouth"
Thats a good session Bo, well done. It seems you are in the minority at the moment, with not a lot of fish showing due to the May water.